Watching the latest news we see a number of remarkable aircraft. These unmanned aerial vehicles are a source of amazement as they go about their task and strike seemingly impossible targets. Few realized that their operational beginnings go back to the 1940’s. 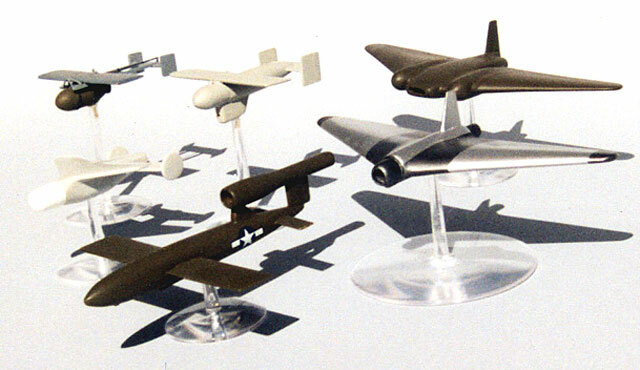 These models built in 1/72 scale represent the height of guided technology of World War Two. 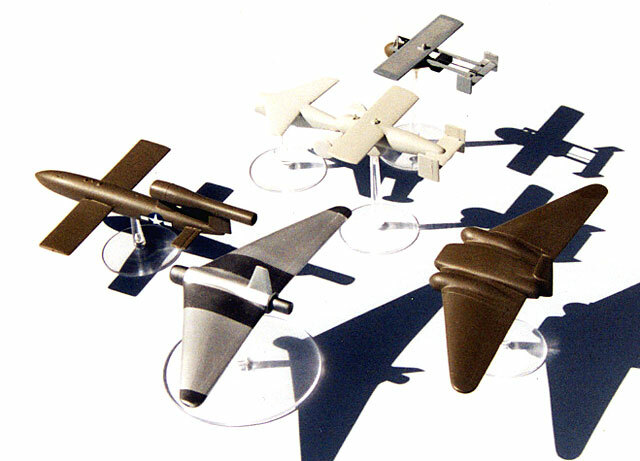 With the Assault Drones, described in other features on the HyperScale website, these devices were the start of the lineage of guided weapons that resulted in the aircraft we so recently saw in action. The Glide Bomb weapons were standard 2000 pound bombs that were given lifting surfaces and means of guidance. The GB-1 was simply directed by surfaces under the controlled of an onboard gyroscope and received no outside commands. GB-4 was a more complex weapon using the same size bomb, but had a television camera installed on its belly. Using it, the bombardier could follow the weapons flight and remotely give it commands and fly it into a target. These were used against targets in Cologne, Germany and Le Havre France during 1944. They were dropped by B-17s from the aircraft’s wing mounted bomb racks. These models were made from True Details 2000 pound bombs and styrene plastic sheets. The aft section of the GB-4 was created from a larger scale drop tank cut and sanded to shape. Both have a two inch wingspan in this scale. The SWOD BAT is described in another Feature on the Hyperscale web site. A master was made since two were carried and dropped from a PB4-Y Privateer. All together three were produced using Bare Metal Foil’s Pour A Cast resin, two that are hung on a Privateer model and the one shown here. The model is about two inches long. BATs were used against Japanese targets starting the spring of 1945. Using the onboard radar guided system BATs struck a number of ships and land targets. The Jet Bomb Two was an American copy of the German’s V-1. Republic Aircraft built the airframe while Ford produced the pulse jet engine. Many were in the process of being readied in anticipation for the attack of Japan. The model was created by modifying a V-1 model, with most of the work being done around the forward pylon. The Northrop Jet Bomb One and Ten were also intended to strike Japanese targets. Both were to be launched, like the JB-2 using a rocket propelled sled to bring them up to speed. JB-1 was to be powered by a simplified turbo-jet engine but its development was becoming too costly. The turbo-jet engine was replaced by a pulse jet engine and this version was designated the JB-10. Since both JBs and a few other Northrop projects I am planning to make use generally the same wings, I created a master set and cast them using the Pour A Cast resin. The different center sections were then scratchbuilt from styrene sheets and tubes and the wings were CA glued onto them. The JBs used magnesium in their construction and I used the Testor’s Model Masters color to paint the JB-10 since photos show a bare metal wing. Testor’s solvent based paints were used on all the models. 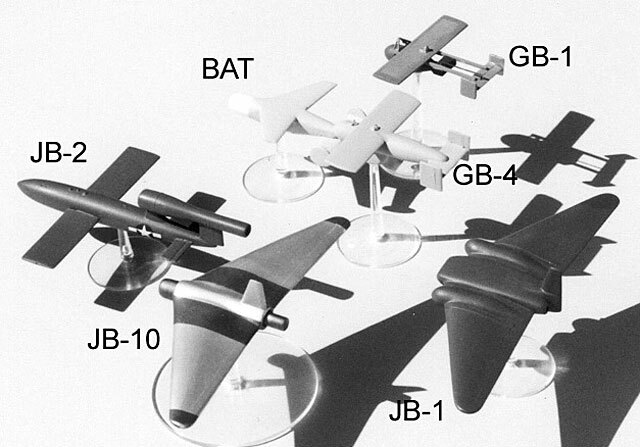 The JBs models have a wing span of 4.625 inches. There were a number of other guided weapons under devolvement during this time period, but these were the ones that either saw action or were in the process of being readied for the attack that was planned for the Fall of 1945 on Japan. These models make a nice contrast that compliments the larger bomber types in my model collection.